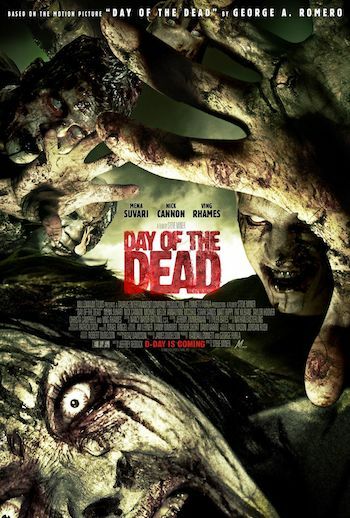 As expected, Day Of The Dead (2008 edition – now with CGI!) is horrible, but in its defense, it never really gets as horrible as I assumed it would be when my Zombie Movie Obsessive Compulsive Disorder got the better of me and I couldn’t stop myself from watching since it had “dead” in the title. Sure, there were plenty of reasons to hate this movie (Mena Suvari as a tough as nails soldier? I had to look in the mirror to make sure some zombie virus hadn’t attacked my freaking brain when I heard that one! ), but whenever my hatred would edge into murderous loathing territory, Nick Cannon would go and do something like kick a severed zombie head like a soccer ball while dispensing some potty mouthed bit of dialogue! I guess this is some kind of remake or re-imagining or regurgitation of George Romero’s Day Of The Dead. Because it has the same title. And has zombies. Some characters also share the same names as in the original and there’s a missile silo involved. There’s even a semi-intelligent zombie who one of the characters likes. But this all-new, all-shot-in-cheap-Bulgaria Day Of The Dead gives that plot point its own unique spin. Whereas in the original movie, the smart zombie was named Bub, in this new version, he’s called Bud! I’ll bet not even George Romero thought of that! Definite upgrade! This Day Of The Dead is such a direct-to-DVD zombiegasm that it tries to get you to hate it as soon as it starts! Teenagers making out! In an old abandoned something or other in the woods! I shouldn’t have really been surprised since horror movie director zombie Steve Miner was in charge of things! With a resume that includes Friday The 13th Part II AND Friday The 13th Part III, he just couldn’t stop himself! It’s like he retained some part of his past life, just like the zombies in this movie! Oh no! Bits of personality remain with these zombies? It just provides entirely unconvincing reasons for all sorts of idiotic, but awesome stuff these things do! A zombie listening to the radio? And recognizing her son’s voice? And processing what’s being said on the radio enough to travel to his location? That’s only apocalyptically brain dead if there wasn’t already a zombie who didn’t eat his friends because he was a vegetarian! Whatever! You’re either a vegan zombie or you’re just posing! And zombies driving pick up trucks? Well heck, that probably isn’t really any more dangerous than the rednecks who usually drive them! Mena Suvari’s character is part of an army detachment that’s been dispatched to a small Colorado town to quarantine it due to some mysterious sickness. But it isn’t just any small town! It’s her home town! So she spends most of her mission checking on her family, fighting with her younger brother and pretty much just going as AWOL as she can! It’s not that big of deal though since her commanding officer is Ving Rhames and he’s so beyond slumming in this thing that he’s probably looking to go AWOL before she is! And we can sympathize with Ving’s feelings because the movie is littered with stupid and illogical behavior, designed solely to propel the story through its unsurprising paces. In a town entirely taken over by zombies, two of the teenagers we saw at the beginning of the movie risk life and limb to trap themselves inside a radio station, only because they saw the silhouette of a person in the window! And no one who has ever seen a zombie movie would keep one with them in their vehicle instead of killing or ditching him! That this zombie ends up helping them out later, only proves how dirt stupid the whole project is! And I don’t know what’s more cliched at this point – having everyone split up to search for something or having someone comment on how cliched it is to split up. The ending is just as moronic as you would expect with the good guys lucking into the very facility where all the information on the zombie outbreak is. And how is it that just because someone was a brilliant scientist, they become a super-zombie capable of ducking out of the way of the combined firepower of all the good guys? Good guys who have spent most of the movie effortlessly slaughtering legions of the undead in every way imaginable! Possibly the least convincing moments in the movie are when Mena gets all survivalist on us and starts babbling about making Molotov cocktails and using canisters of something or other to make a huge flamethrower to roast all the zombies that have somehow also found their way to the allegedly secret facility. What keeps the movie from plumbing the depths of zombie rot like Day Of The Dead 2: Contagium is that at least this movie actually resembles a movie and not an episode of Backyard Zombie Amateur Hour. Yes, the 28 Days Later… and Dawn Of The Dead remake style of fast cuts and spastic camera work combined with an over-reliance on computer effects (is it too much to ask to see someone fondling some real life pig guts?) is strictly retread territory, but at least it’s done professionally and in spite of how dumb almost everything that happens is, the zombie attacks and resulting carnage should be barely enough to keep you from shutting this thing down early. Besides, you do want to see Ving Rhames eat his own eyeball, don’t you?